While public transit is required to help accommodate the area’s population growth, the central question is what technology do we require to solve what problem? And when do you use one versus the other? So where rail transit might be economically sound by re-purposing along existing rail corridors surrounded by high-density populations, does it make sense to use rail transit all of the time? Is rail the only tool in the transit kit? The DOLRT study area projects 32% population growth. It is the lowest projection of the counties and regions in the study, suggesting that there are other population areas that are growing substantially FASTER than the DOLRT corridor. Based on the Alternative Analysis, the corridor study area is projected by 2035 to have a population density of 4052 ppsm or people per square mile (231K / 57). Using 1/2 mile walk-up radius around each of the 17 proposed stations, approximately 68,000 people will be within walking distance of a station. The national average for public transportation utilization is 5% (Durham 3%). This suggests walk access will be approximately 6800 daily boardings (68K * 5% * 2) rather than the projected 12,180 by GoTriangle in 2040. So how much population density do we need to make light rail cost-effective? Let’s do the math, there are 640 acres in one square mile. So that means we would require a density of 19,200 people per square mile. 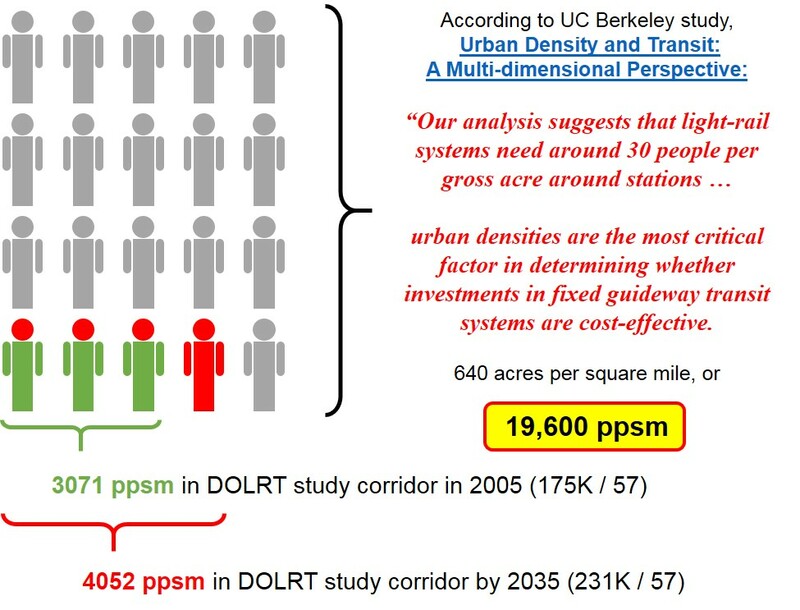 So with our current 3071 ppsm (175K / 57) along the DOLRT study corridor, that is 16% of the recommended population density. 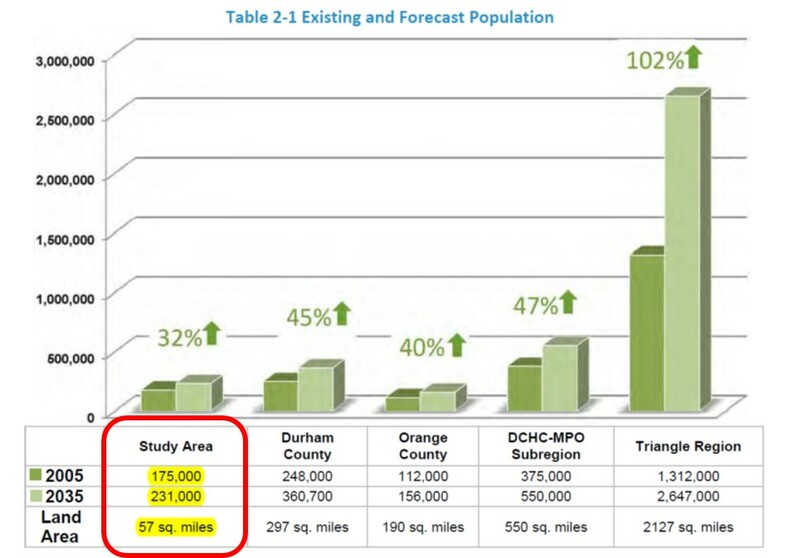 Or stated differently, we would have to reach a population of over 1 million people by 2040 (or today’s entire Wake county population) just within the 57 square mile study corridor.